The Moss Landing Data Center (MPSL-MLML Data Center) is one of four regional data centers that support the California Environmental Data Exchange Network (CEDEN). 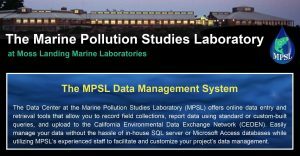 The MPSL-MLML Data Center is managed through the Marine Pollution Studies Laboratory (MPSL) at Moss Landing Marine Laboratories (MLML). Our mission is to collaborate with data partners to assist in creating and compiling comparable data sets and to develop applications with the goal of assisting with data analysis and improving environmental quality. The MPSL-MLML Data Center works with data generators throughout California, with the majority from the Central Coast and Northern California, to help standardize and store their data for review and transfer to CEDEN. The main site pages include a "How to Submit Data" page, informing new users about the MPSL-MLML Data Center data submission process and how that data is transferred to CEDEN. Direct links for current users include Data Entry Tools (Field Data Sheets, Templates & Documentation, other Tools), Data Submittal (Online Data Checkers), Data Analysis Tools (Online Data Management System & Advanced Query Tool) and Webinar Trainings. If you need assistance please contact the MPSL-MLML Help Desk.